With Governor Doug Ducey signing universal licensing reform into law, Arizona is empowering veterans, their families, and taxpayers by creating new opportunities for employment. Our state has become a model for licensing reform and protecting the right to earn a living. 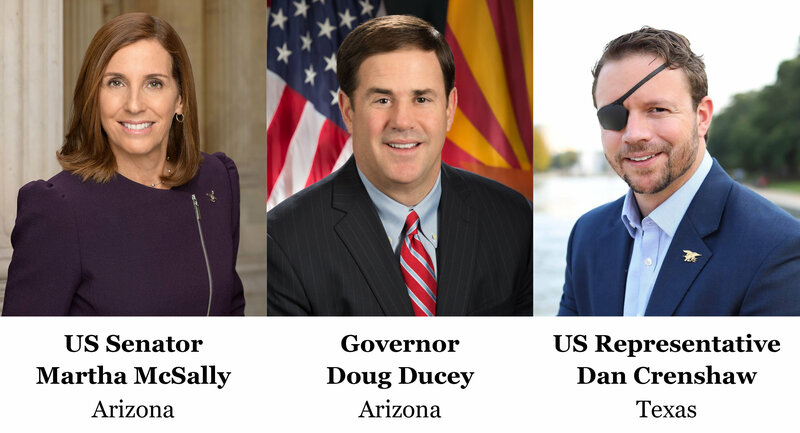 This event will showcase policymakers and activists who are empowering Arizonans to join career paths more rapidly and excel in the workforce, while cutting through bureaucratic red tape. For additional details and to reserve a table, please contact Austin Jack at ajack@goldwaterinistitute.org. Buffet style dinner will be served. Valet service and self parking available on resort property. For more information please contact us at events@goldwaterinstitute.org or call 602-633-8984. Martha McSally served as a colonel and fighter pilot in the US Air Force. In 2004, Senator McSally took over as commander of the 354th Fighter Squadron, becoming the first woman in U.S. history to command a combat aviation unit. As Squadron Commander, Senator McSally flew for 225 combat hours in Afghanistan, leading her A-10 combat team during Operation Enduring Freedom from September 2005 to February 2006. For her combat leadership, Senator McSally was awarded the Bronze Star and her squadron earned the Air Force Association David C. Schilling Award for the most outstanding contribution in the field of flight in 2006. Martha McSally joined the US Senate in January 2019. Dan Crenshaw served for 10 years as a US Navy SEAL with his first tour of duty taking place during Operation Enduring Freedom in Afghanistan. On Dan’s third deployment in 2012, his life changed forever. After six months of combat operations, he was hit by an IED blast during a mission in Helmand province, Afghanistan. He was evacuated and awoke from his medically induced coma learning that his right eye had been destroyed in the blast and his left eye was badly damaged. Dan was completely blind and the doctors did not believe he would ever see again. After several difficult surgeries and months of fighting a tough diagnosis, Dan eventually regained sight in his left eye, a miracle according to the head surgeon. Dan refused to quit and went on to deploy twice more, first back to the Middle East in 2014 and then South Korea in 2016. In November 2018, Dan was elected to represent the people of Texas’s Second Congressional District.